Soak skewers in warm water 20 to 30 minutes. Peel shrimp, keeping heads on; reserve shells. Heat 2 Tbsp. olive oil and 2 Tbsp. butter in a pan over medium-high heat. Add shells, peppercorns, and bay leaves; cook 3 minutes or until shells change color. Add 2 cups water; increase heat, and simmer 10 to 12 minutes. Remove from heat; our through a fine wire-mesh strainer into a bowl. Discard solids, and reserve stock. Light charcoal grill or preheat gas grill to 350-400 degrees (medium-high). Thread shrimp on skewers. Heat remaining 2 Tbsp. olive oil in pan over medium-high heat 1 minute. Add garlic; cook 1 minute. Reduce heat to medium; add rosemary, and cook 2 minutes. Add Worcestershire sauce, pepper, and 1 cup reserved shrimp stock; increase heat, and simmer until reduced by half. Brush some of sauce over shrimp, reserving remaining sauce. Place skewers on cooking grate; grill 2 minutes on each side. Slice bread; brush with extra virgin olive oil, and season with salt. Grill until toasted. Reheat remaining sauce over medium-high heat; whisk in remaining 8 Tbsp. butter, 2 Tbsp. at a time. Place 1 skewer of shrimp on each serving plate, top with sauce, and serve with bread. 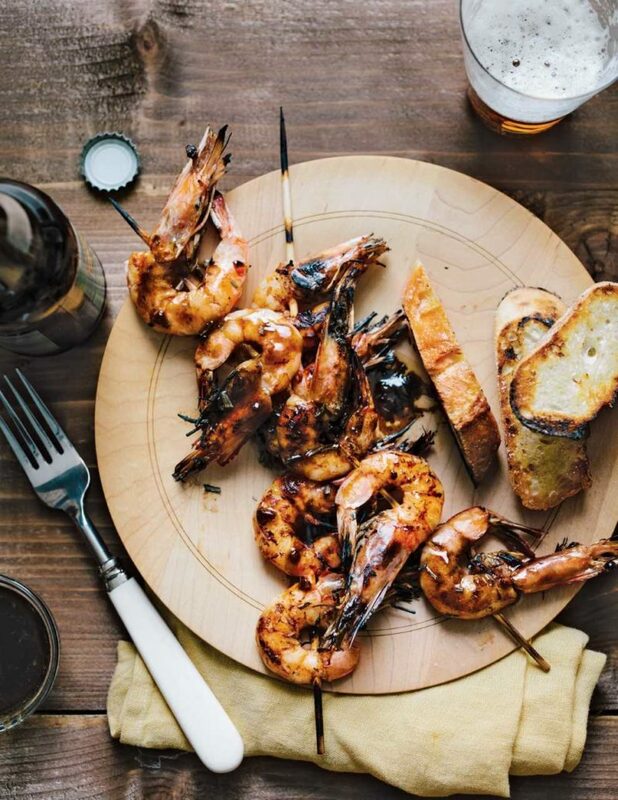 Chef David Guas is Chef/Owner of Bayou Bakery, Coffee Bar & Eatery in Arlington, VA and Lil’ B in Washington, D.C.
Editor’s note: For the best results, always use Wild American Shrimp from the warm waters of the Gulf and South Atlantic whenever you prepare shrimp dishes. Be sure to look for the Wild American emblem or wild-caught, Gulf or South Atlantic shrimp, product of the U.S.A.